Most phone users are concerned about network usage. Network traffic comes at a premium, and a user’s perception of the quality of your app depends a lot on its responsiveness. When it comes to fetching data from a network service, it should be done in the most efficient manner possible. Making the user wait while your app downloads giant reams of data doesn’t cut it. It should, instead, be done in bite-sized chunks. Notice the AtEndCommand. That’s an attached property that allows you to specify a command to be executed when the user scrolls to the end of the list. Easy huh! I’ll explain in a moment how this is accomplished, but first some background. For almost the last year, I’ve been building infrastructure for WP7 development. A lot has been going into the book I am writing, and even more is making its way into the upcoming Calcium for Windows Phone. I am pretty much at bursting point; wanting to get this stuff out there. 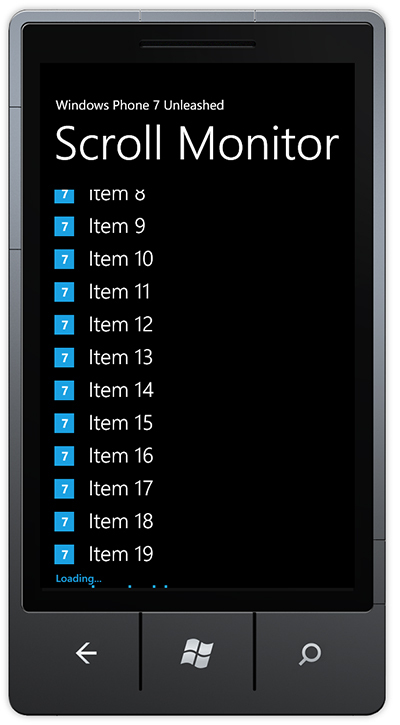 The chapter of Windows Phone 7 Unleashed, which discusses this code, demonstrates an Ebay search app that makes use of the Ebay OData feed (see Figure 1). It’s simple, yet shows off some really nice techniques for handling asynchronous network calls. Figure 1: The Ebay Seach app from Windows Phone 7 Unleashed. The Ebay app isn’t in the downloadable code for this post. But there is a simpler app that displays a list of numbers instead. The way the ScrollViewerMonitor works is by retrieving the first child ScrollViewer control from its target (a ListBox in this case). It then listens to its VerticalOffset property for changes. When a change occurs, and the ScrollableHeight of the scrollViewer is the same as the VerticalOffset, the AtEndCommand is executed. Of course there is a little hocus pocus that goes on behind the scenes. The VerticalOffset property is a dependency property, and to monitor it for changes I’ve borrowed some of Pete Blois‘s code, which allows us to track any dependency property for changes. This class is called BindingListener and is in the downloadable sample code. The ViewModel for the MainPage contains a FetchMoreDataCommand. When executed, this command sets a Busy flag, and waits a little while, then adds some more items to the ObservableCollection that the ListBox in the view is data-bound too. /* We invoke back to the UI thread. There’s a lot more infrastructure provided with the book code. But I tried hard to slim everything down for this post. The MainPage.xaml contains a Grid with a ProgressBar, whose visbility depends on the Busy property of the viewmodel. You may be wondering why there is a databinding for ProgressBar’s IsIndeterminate property. This is for performance reasons, as when indeterminate the ProgressBar is notorious for consuming CPU. Check out Jeff Wilcox’s blog for a solution. Now, when the user scrolls to the bottom of the list, the FetchMoreDataCommand is executed, providing an opportunity to call some network service asynchronously (see Figure 2). Figure 2: Loading message is displayed when the user scrolls to the end of the list. I hope you enjoyed this post, and that you find the attached code useful. If you are interested in up-to-the-minute WP7 info, check out the Windows Phone Experts group on LinkedIn. Next Next post: Windows Phone Mango change, Listbox: How to detect compression(end of scroll) states ?